Sigh. I guess, maybe, perhaps this is better or at least the least offensive option. 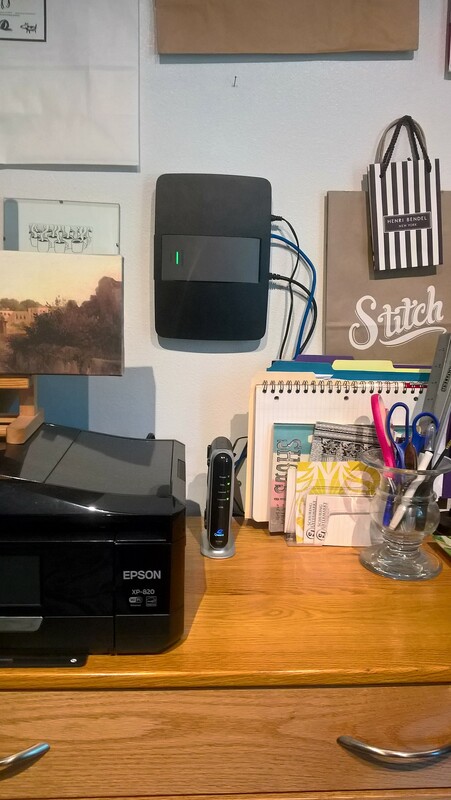 For some reason, that I missed because I wasn’t paying attention when it was uttered, the hubs said the best place for the router is my studio/office. First it sat on the cabinet, cords tucked behind it and its ugly-but-necessary e-cousins. When reception went wonky, heat was the suspected culprit. Then it sat perched on a stump of PVC pipe. Other e-issues, now determined to be unrelated to the router, hiked it to the wall, cords flowing in all their un-glory. The hubs thinks this works better. Tried to sell it to me as opening up space. What you see is all the space it ‘opened’ but protesting is futile. I’m trying to look at the end result as an art installation that speaks to our electronic age. After all, not like I’m going to give up the interwebs any time soon. And while we’re talking about untastefulness, the Henri Bendel bag held candles purchased as gifts. I can’t bear that you might think otherwise.